Imagine this for a day... no, a week, actually, one entire month. Let's just imagine you are staying in the south of France for a month and you have this beautiful kitchen to work in, to cook in, to live in. I'm not sure where this kitchen is located but it's fun to place it in France. 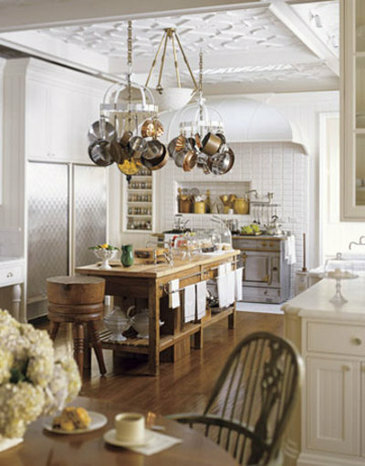 Susan Dossetter is the designer and owner of this kitchen and Seleta, designer and beach mom, found these pretty photos. Seleta lives in one of my favorite places in the world, "30A wonderland"... it's a little part of the beach on the Gulf of Mexico and it is "practically perfect in every way". There is amazing architecture, gorgeous beach, cute shops, cafes and bike paths everywhere (which is my favorite part of this beach). I met Seleta a few weeks ago at an art show in her neighborhood, and she was so fun and bubbly to talk with! Her light-hearted way of looking at life and seeing beauty and laughter all mixed together is so refreshing. Back to the kitchen.... Seleta has a beautiful post about it on her blog. Check it out here. Seleta's blog is filled with fun ideas for design and gorgeous photos plus, she has a great sense of humor and you'll definitely be laughing after reading her post, "Daddy Day-Care." The stove.... 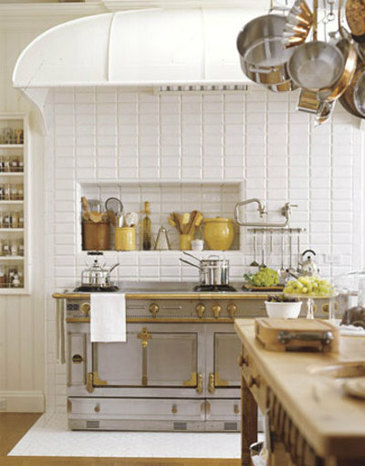 I've never thought about a stove as a work of art until I saw this one. Fun to walk into other people's kitchens through photos and imagination. I think it was Albert Einstein who said, "imagination is everything." There really is so much to be said about that special word... imagination... but another day for those thoughts! Thanks Seleta for finding these fairyland kitchen photos!